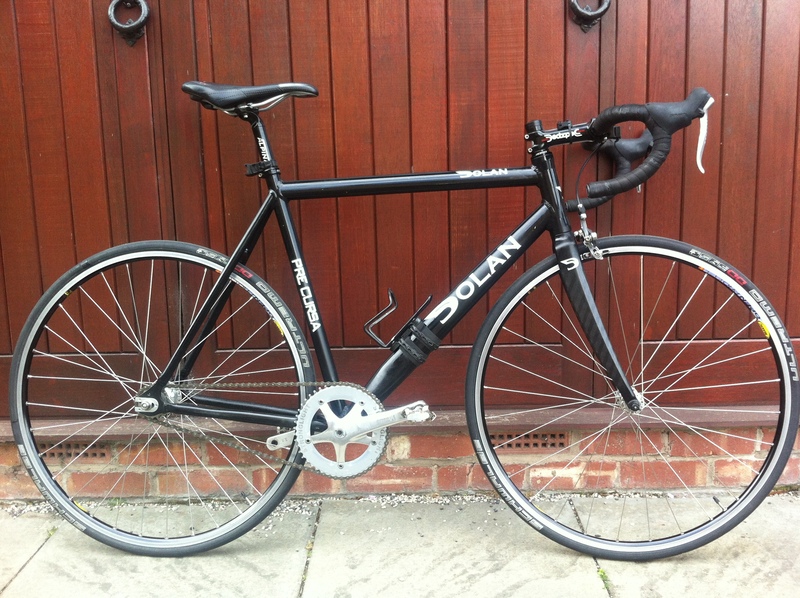 The Dolan is my second fixed gear bike, born from the ashes of my old Langster. For a £200 frame and fork, it’s flipping awesome! 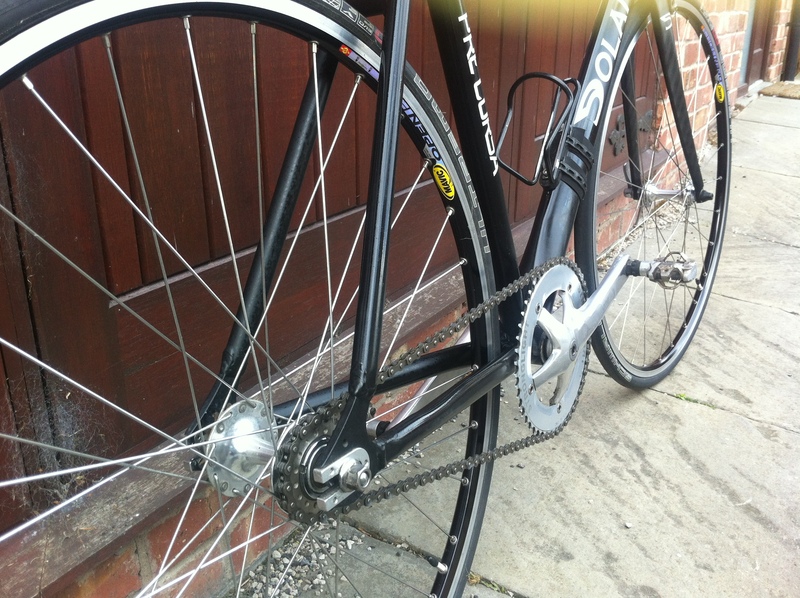 Mavic Open Pro’s (like all my other road wheels…) and SRAM brakes and it’s a fast commuter and cracking winter trainer for bombing round the Cheshire lanes at night. The only trouble is that there’s no rear brake drilling. Not a massive problem as I never really used the rear brake riding fixed, but as I ride on the hoods a lot, I’ve put the rear brake lever on and a section of out cable under the bar tape, just so it feels the same. I’ve taped up the lever to stop it flapping around. Bottle cages are the other little problem, but Decathlon came to the rescue for a fiver and some old bar tape keeps it from slipping. great little write-up. Ive just bought the same bike from Graham Weigh, just didn’t like the forks they fitted, preferring the straight track style. Cycled Plymouth to Wadebridge this weekend (50miles) with a stop off mid way at Lewannic for a drink (no bottle cage yet) then on to Davidstow, Camelford, wadebridge head wind all the way Strava on 3:20hrs nice little run will try again soon bike performed really well great fun. 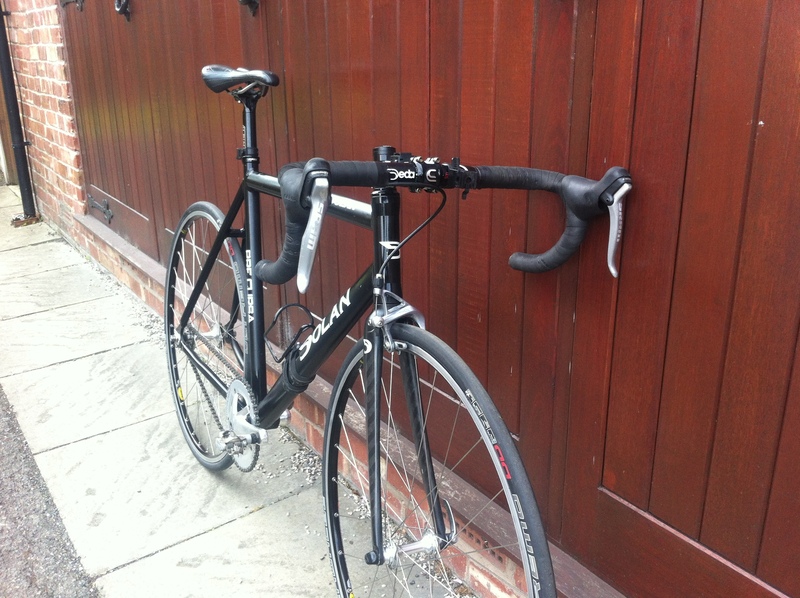 Bike is light, stiff-as and a real joy to ride…will be my winter trainer of choice and perhaps might transition from singlespeed to fixed once I stop being such a chicken….